Our understanding of vegan nutrition has come a long way in the last 200 years, but it had to start somewhere, and William Lambe (1765-1848), Fellow of the Royal College of Physicians, was the first to be specific about it way back in 1809. In 1806, age 41, Lambe was concerned about his own state of health, and changed his diet to exclusively plant foods and distilled water. The word ‘vegetable’ in those days included all types of vegetation (as in ‘animal, vegetable or mineral’), so the ‘vegetable diet’ as it was commonly known, included fruits, grains, nuts, beans etc. Most people following this diet included cow’s milk, but Dr. Lambe did not – and he kept to his strictly vegetable/vegan diet for the rest of life, still looking good near the end 41 years later - the photo below was taken not long before he died. 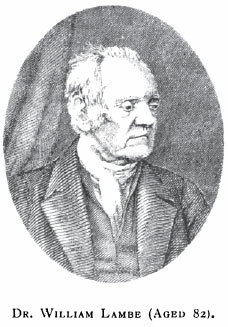 Amongst his many writings, Lambe left us two books of particular interest: “Reports on the Effects of a Peculiar Regimen in Scirrhous Tumours, and Cancerous Ulcers” (1809), followed by his ‘Additional Reports’, more fully titled “Water and Vegetable Diet in Consumption, Scrofula, Cancer, Asthma, and Other Chronic Diseases” (1815) – both of these were primarily reports on his own condition and self-treatment, but included case studies from some patients. On the IVU website we now have the full text of the only known biography of Dr. Lambe (see the link below). This was written in 1873 by Edward Hare (1812-1897), who was a former Director-General of Hospitals in Bengal, India. There is currently little further known about Mr. Hare, except that in 1881 he was living in the City of Bath, and by 1891 he had become a Vice-President of the Vegetarian Society. However, from expressions of his own views in the book, it becomes clear that he too shared Dr. Lambe’s view of what we now call a ‘vegan’ diet. Mr. Hare also says that Dr. Lambe only used small quantities even of distilled water: “He said that man was not a drinking animal, his erect form showed it. In a state of nature man could not conveniently stoop to drink out of streams, etc. – and if we lived upon fruit and vegetables we should not have thirst.” This argument against the need for any drink at all appears from time to time among 19th century vegetarians, and was used against milk drinking in particular (note the change to ‘fruit and vegetables’ as the meaning of ‘vegetable’ was changing in the late 19th century). Lambe’s books were widely read on both sides of the Atlantic. In 1850 the second of his books mentioned above was published in New York, with ‘notes and additions’ by Joel Shew M.D., who was a Vice-President of the new American Vegetarian Society founded the same year. The file linked below includes a link to a complete copy of that edition on Google Books. In 1883 Howard Williams wrote his ‘Ethics of Diet’ – the first book on the history of vegetarianism, which was hugely influential and which included substantial quotes from Mr. Hare’s biography of William Lambe. However, Williams, like all vegetarian historians, simply avoided any mention of the eggs/dairy issue. It is only now that we are beginning to re-discover the significant minority within the vegetarian movement who kept to the stricter version of the ‘vegetable diet’. - includes link to complete original volumes by Dr. Lambe and his patient John Frank Newton.